WebMail is included in all normal trials and is part of the Professional edition of Mailtraq. 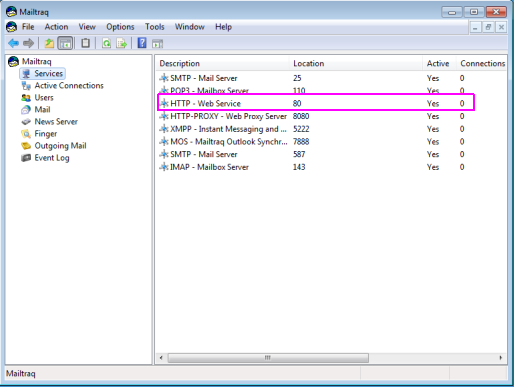 If you have installed Mailtraq Professional as a new install or as a Trial, WebMail will be already setup - you can look in Active Connections in the Mailtraq Console for confirmation. If you need to (re-)install Webmail manually you may do so from Tools | Webmail Install Wizard. You access webmail by browsing to the Mailtraq machine - and logging in. 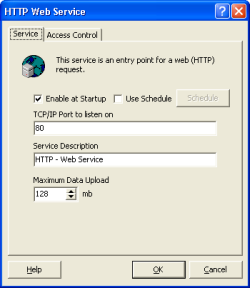 There is more information about solving problems with accessing webmail here, including tips on NAT or router port-forwarding settings. For each user who will be allowed to use WebMail, select the User, and click Properties. Webmail runs by default on Port 80. If you are running a website on the same system as Mailtraq you will need to change the port that webmail uses to avoid a conflict - as websites must run on Port 80. The webmail Administration page allows you to permit or deny the sending of attachments using Webmail. If you want to allow the sending of attachments, but limit the size (so users do not attempts to email very large attachments - such as an entire DVD) you can set a limit to the overall data size in the HTTP service associated with webmail.